Today was a perfect day for a trip to the zoo. The same friends we went blueberry picking with a few weeks ago asked if we’d be interested in going to Binder Park Zoo for the day. They’ve never taken their daughter there and they’ve seen all the great pictures we’ve taken of L which made them want to check the place out. We met at the entrance to the zoo at 1:00 then headed straight for someplace to eat. Luckily for us, there are two restaurants inside the zoo. We chose the one closest to the entrance. 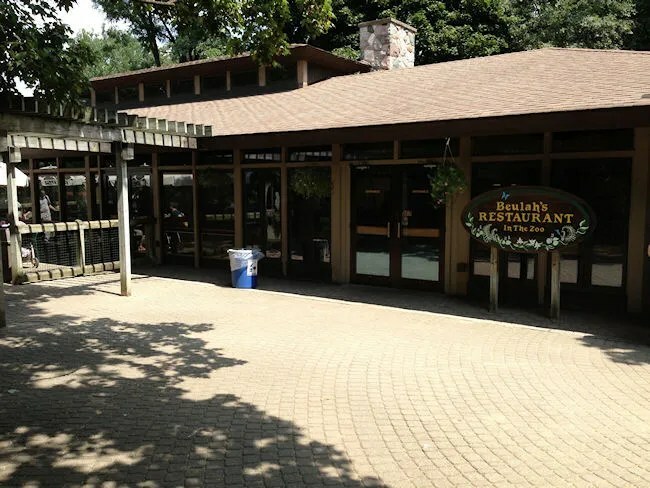 Beulah’s Restaurant is a cafeteria style eatery located in the center of the original part of the zoo near the Kangaroos. The space is divided in to three parts. You enter in to an order area where they have samples of all of their food on display. There’s a menu board hanging above the area where an employee asks what you’d like to eat. Once deciding, the first employee yells back to the kitchen area where pre-cooked meals are put together in paper boats then passed up to the original employee. The quick service menu doesn’t have any surprises. There are sandwich options, pizza slices (or whole pizzas if you want to feed the family) and chicken strips. I chose the Cheeseburger basket. The simple burger kind of works like a McDonalds burger. They cook it ahead of time and keep it in a warmer until it’s needed. A slice of American cheese is put on a bun with lettuce and a slice of tomato then topped with the burger patty. 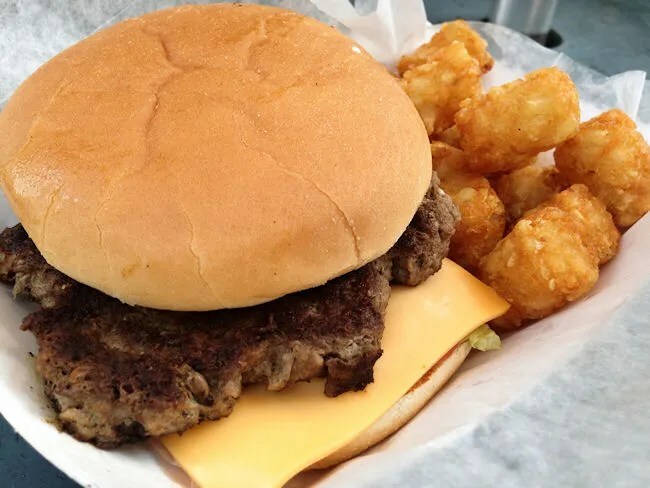 The burger is a simple sandwich which is slightly better than a fast food burger. It kind of has summer cook-out type of taste to it. 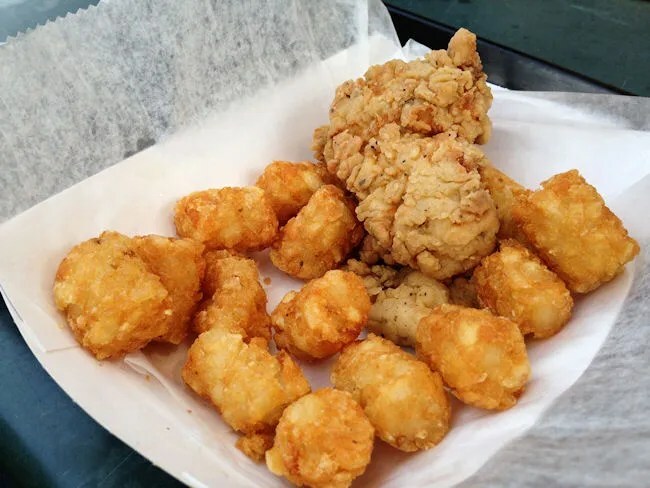 The baskets all come with tater-tots. 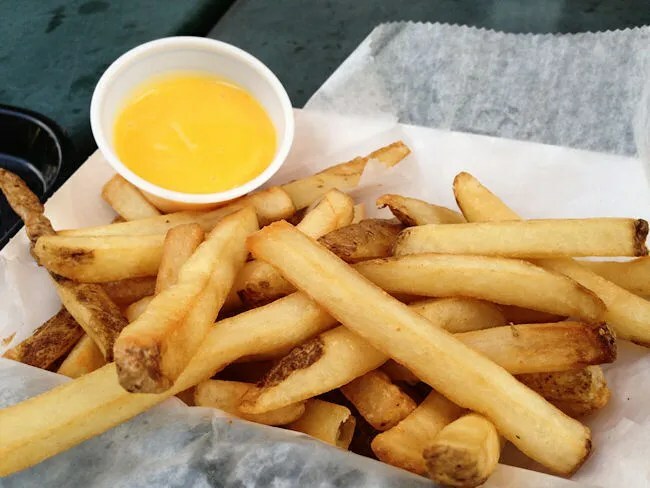 I’m not a fan of tater-tots so I ordered cheese fries to go along with my burger and planned on giving my tots to L. The fries are skin on and the cheese part is a little cup of nacho cheese. Again, quick and simple. J ordered the Chicken Tender basket to share with L. They do have a pretty good kids menu, but we figured between the two of us, there would be enough for leftover food for L. The basket comes with three golden brown tenders and the tater-tots. Both ladies seemed to like them and didn’t have any complaints. For drinks, they have fountain Pepsi products. I already had a bottle of Pepsi, so I passed on a pop for the time being. J ordered a medium Sierra Mist. The odd thing here is that there were no lids for the cups. It’s one of those things that wouldn’t really have bothered me, but it’s something we found a little weird. The total for the two baskets, extra order of fries and a drink was a little over $16. 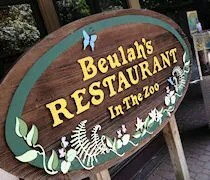 Beulah’s is by no means gourmet, but it’s a perfect lunch spot while at the zoo. It’s not really overpriced, it’s quick, and it’s simple food that always taste good. A few zoos that I’ve been to also don’t have lids for the cups because they don’t want them to end up in the animal habitats. The animals could possibly choke on them. Never thought of that…but it makes sense. Thanks!